This entry was posted in Inside Search Blog and tagged Google Search, Seach, Search, Search Engine on April 11, 2019 by Search. It’s awards season, and that means glitz, glam and gold statues. Google is making it easy to keep up with your favorite flicks and celebs no matter where you turn, with new ways to stay up on the buzz with Google Search, Google Images and Google News. And as we await the announcements of Sunday’s winners, we took a look at the celebs and movies people have searched for—and the trailers they’ve watched on YouTube—to see who and what is capturing our attention, both on and off the screen. It’s arguably everyone’s favorite part of the night. Actors and actresses alike strut their stuff on the red carpet, and many people turn to Google Images to check out their camera-ready looks. Stay up-to-date on your favorite celebrities this Sunday with a special “Latest” section on Google Images, available on mobile web browsers. If you search for pictures from the red carpet, or a celebrity nominated for an award, Google Images will not only show you the most relevant web pages and photos from across the web related to your search, but will show you the most recent images, too. To help you learn more about your favorite celebrities, we recently launched stories on Knowledge Panels in Search, which provide an overview of notable moments from their lives and help you visually discover information from across the web. For the first time, we’re bringing these stories to Google Images, and we’re also introducing new stories about popular events like award shows. Rolling out this week, if you search for nominees on Search or Google Images, you’ll see a story showcasing information about their nominations, fellow nominees and other nods they’ve received throughout the 2019 awards season. Searches for “Oscars” have been on the rise leading up to the big night, and Search can help you explore more info about the films and actors, and stay up to date as results roll in on Sunday. If you want to go in depth, Google News will help you dive into all the news stories behind the nominees, red carpet, presenters and more. If you’re placing any bets on the big screen’s best films of the year, perhaps you can take a hint from top lists from Search and YouTube. Even if they don’t take home a statue, these films have captured people’s hearts this year. This entry was posted in Inside Search Blog and tagged Google Search, Seach, Search, Search Engine, YouTube on February 19, 2019 by Search. In August 2018, Google made a commitment to veterans, military spouses, and service members transitioning to civilian careers. At that time, we announced a job search experience that uses military occupational specialty codes to connect service members and veterans with open jobs that call for skills developed during their time in service. In the months since, we’ve continued our work to make it even more useful for those who are searching for civilian jobs and the amazing people who support and guide them. 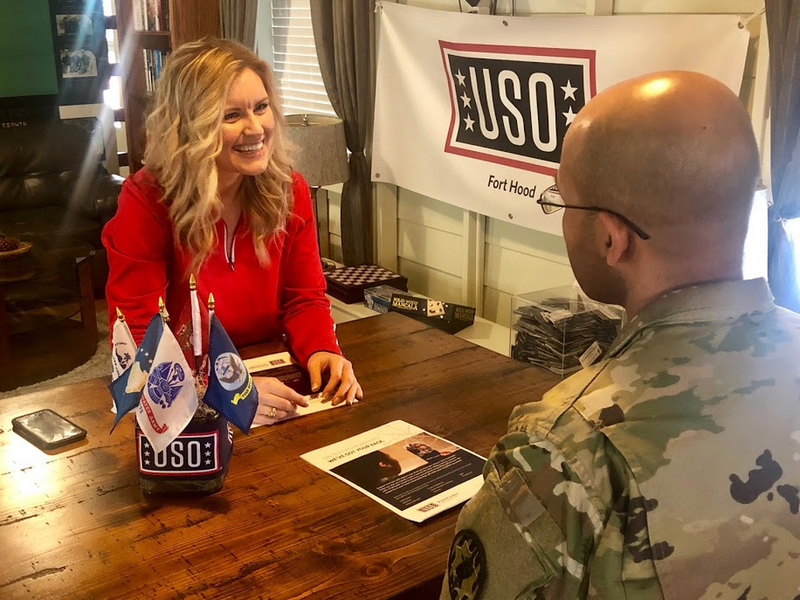 People like Kristen Rheinlander, who works as the Transition Site Manager of the USO Pathfinder Program at Fort Hood, Texas. A self-described Army brat whose father served in the military for 25 years, Kristen came to the USO as a volunteer 4 years ago. Today, she heads up a team that works with service members and their families as they prepare for a new challenge: figuring out what comes next. Every new challenge has a first step, and for Kristen, it starts with helping people see the connections between the skills they developed in the military and civilian jobs. By introducing her clients to the Google Search tool early in the process, she’s able to show them the types of occupations that align with their expertise, whether demand for a field is projected to grow, and active job listings in a given geographic area. It’s a confidence booster, she says—the search tool is a translator that “puts words to the unknown,” providing greater clarity for clients unsure of which roles, companies, and industries align with what they’re looking to do next. After finding a lead through the Google Search tool, Kristen works with her clients to begin crafting resumes that highlight their military experiences in language civilian employers use and understand. Showing how military occupational specialty codes can connect service members and veterans with open jobs using Google Search. Helping people find connections between skills developed in the military and civilian jobs is just one of the many ways we’re working to create useful tools and programs for transitioning service members, veterans, and military families—a community that’s sacrificed so much in service to our country. For the over 2.5 million veterans who’ve decided that their next step is owning their own business, we’ve created a “Veteran-Led” attribute for their Google My Business profiles. With this badge, veteran-led businesses stand out across Google Search and Maps. And for transitioning service members and military spouses who are interested in the growing field of IT support, we’ve made it easier for them to earn Google’s IT Support Professional Certificate through a $2.5 million grant to the USO. Visit Grow with Google to learn more about job search and our other tools and programs for veterans. Through these resources, we’re working to help service members, veterans, and their families prepare #ForWhateversNext. This entry was posted in Inside Search Blog and tagged Google Search, grow with google, Seach, Search, Search Engine on January 31, 2019 by Search. As the Patriots and Rams head to Atlanta for Sunday’s big spectacle, you can turn to Search and the Google Assistant to stay-in-the-know and get some help prepping to watch the game. We’re taking a look at real-time Google Trends data to see the top questions and topics people are searching for and scoring some pro tips from the Assistant before kick-off. 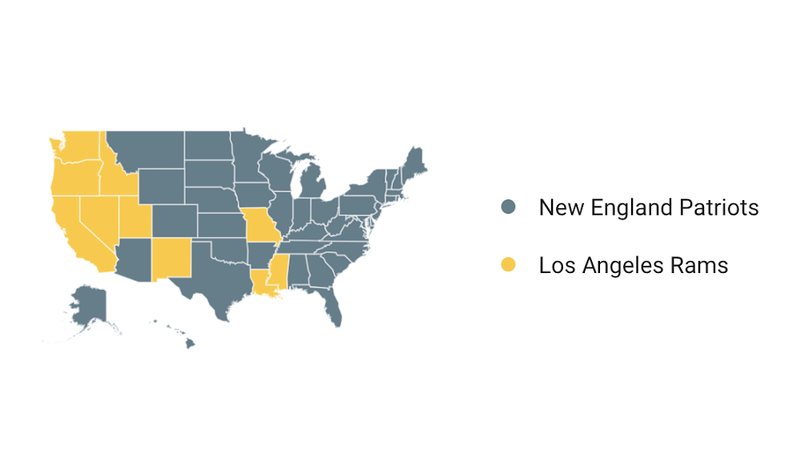 We can’t say whether it’s fandom driving the searches, but this year’s AFC champs are dominating search interest in most states in the U.S.
And the players won’t be the only things turning heads this Sunday. 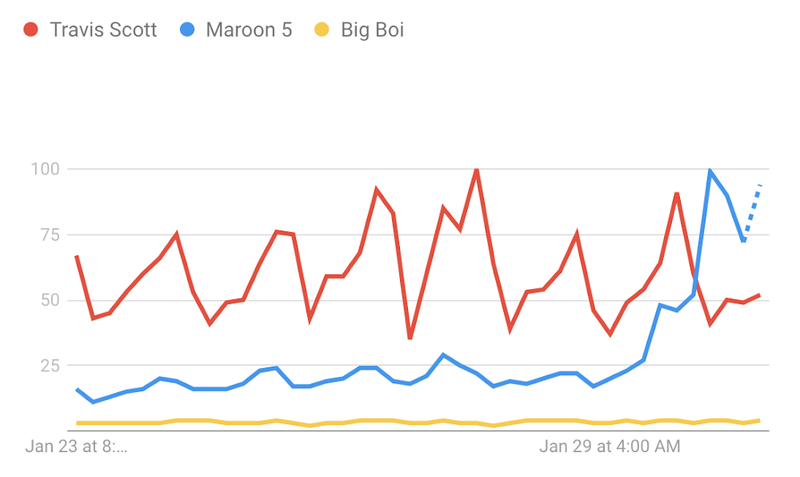 The much-anticipated halftime show also has people searching for this year’s performers Maroon 5, Travis Scott and Big Boi. Regardless of your football or musical preferences, snacks are something that everyone can get excited about. For inspiration on what to make, look no further than the most uniquely-searched Super Bowl recipes by state this year. To stay up-to-date on other trends that are topping the charts this weekend, follow along on our Google Trends page. Everyone has their own game plan for Sunday, and the Assistant has simple ways to help you get in the game—even if football isn’t typically your thing. This year, the Assistant will even share its prediction for how the game might play out. Simply ask, “Hey Google, who’s going to win the big game?” Hint: the Assistant can’t help but root for the underdog. No matter who you’re rooting for this year, Search and the Assistant are here to help you get game day ready. 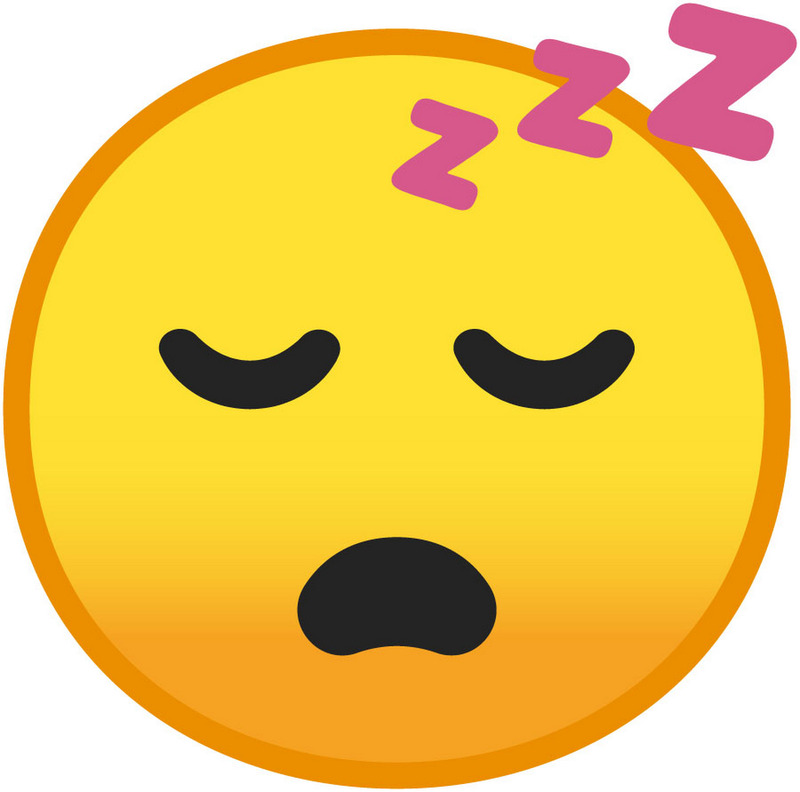 This entry was posted in Inside Search Blog and tagged Google Assistant, Google Search, Seach, Search, Search Engine on January 31, 2019 by Search. While we’ve probably all turned to Google to settle a bet, often we need more than just a quick answer. You might be looking for information to help you complete a longer-running task, whether it’s meal planning for a new food regimen, researching new stretching routines for post-gym recovery or picking up a new hobby. You might come back to Search to find information on the same topic, hoping to retrace your steps or discover new, related ideas. To help you with these ongoing search journeys, we’re launching new activity cards to help you pick up where you left off. If you’re logged into your Google account and search for topics and hobbies like cooking, interior design, fashion, skincare and beauty, fitness, photography and more, you may find an activity card at the top of the results page that provides easy ways to continue your exploration. 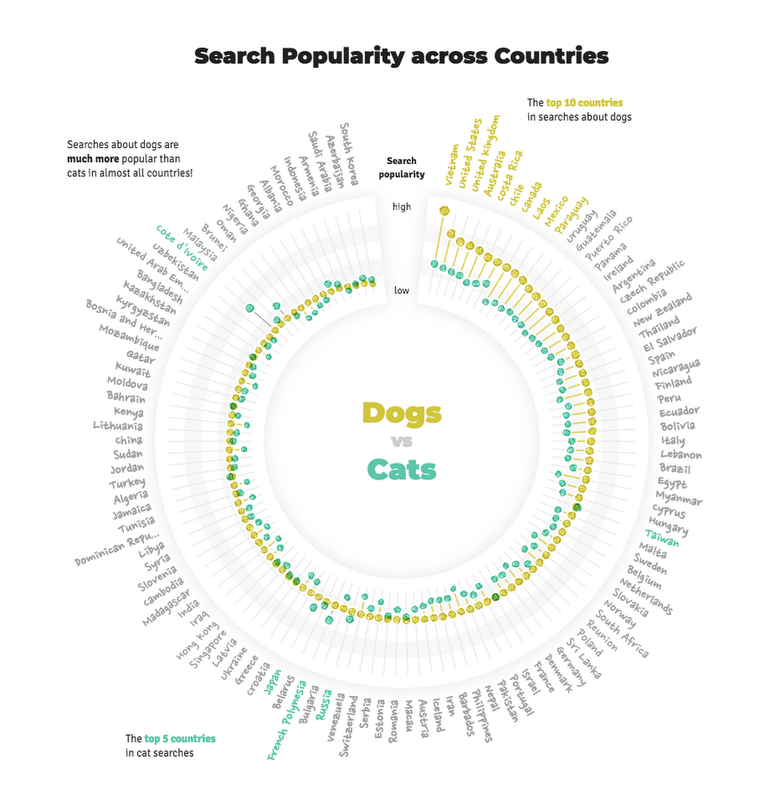 You’ll find links to pages you’ve visited in the past along with searches you’ve done. From there, you can easily click back to that recipe that you tried and loved, or re-issue a search to discover new facets of that topic. If you want to mark a page to read or reference later, just touch and hold the link to quickly add items on your activity card to a collection. You can access your collections by tapping the menu on the top left of the Search page (on mobile web), or through the bottom bar of the Google app. You can control what appears in your activity card by pressing to delete an item or turn off cards by tapping the 3-dot icon. For more options to customize your Search experience, you can access your full history and settings right in Search. Activity cards will roll out today on mobile web and the Google app in English in the U.S. As you’re looking to build new habits or pick up new tasks in the new year--whether sticking to an exercise regimen, sprucing up your winter wardrobe, or collecting new ideas for your home--we hope this new feature helps you along your way and makes your search history more accessible and useful. This entry was posted in Inside Search Blog and tagged Google Search, Seach, Search, Search Engine on January 9, 2019 by Search. Our goal with Gboard is to help you communicate in a way that’s comfortable and natural, regardless of the language you speak. While the ten most common languages cover about half of the world's population, many more thousands of languages are spoken by the other half. As the Next Billion Users come online, technology needs to support their languages so they can get the most out of using the internet. Today, Gboard offers more than 500 language varieties on Android, bringing a smart, AI-driven typing experience to many more people around the world. This means that more than 90% of the world can now type in their first language with Gboard, with keyboard layouts tailored to each language and typing smarts like autocorrect and predictive text. In December 2016, Gboard first launched on Android with about 100 language varieties. Over the last few months, more than one hundred new languages have been added to Gboard, such as Nigerian Pidgin (~30 million speakers), Rangpuri (~15 million speakers), Balinese (~3 million speakers), Pontic Greek (~800,000 speakers) and many more. Gboard currently supports more than 40 writing systems across the world, ranging from alphabets used across many languages, like Roman and Cyrillic, to scripts that are used for only one language, like Ol Chiki (used for Santali). Building technology that works across languages is important: without a keyboard tailored to your language, simple things like messaging friends or family can be a challenge. Often, keyboard apps don’t support the characters and scripts used for languages with a smaller speaking population. As an example, the Nigerian language "Ásụ̀sụ̀ Ị̀gbò" is impossible to type on an English keyboard. Plus, wouldn't it be frustrating to see nearly every word you type incorrectly autocorrected into another language? Many of Gboard’s newly added languages are traditionally not widely written, such as in newspapers or books, so they’re rarely found online. But as we spend more time on our phones on messaging apps and social media, people are now typing in these languages more than ever. The ability to easily type in these languages lets people communicate with others in the language they would normally speak face-to-face as well. In addition to designing a new keyboard layout, every time a new language is added to Gboard we create a new machine learning language model. This model trains Gboard to know when and how to autocorrect your typing, or to predict your next word. For languages like English, which has only about 30 characters and large amounts of written materials widely available, this is easy. For many of the world's languages, though, this process is much harder. Next, we focus on the layout design. Layout design for a new language on Gboard requires careful investigation and research to fit in all the characters in a way that makes sense to native speakers. If there isn’t a lot of information for the language available online, we'll analyze text corpora to figure out which characters to include and to determine how frequently they’re used. Depending on the language, we may tailor aspects of the layout, like the set of digits—for example, while English uses 0123456789, Hindi and other Indian languages written in Devanagari use ०१२३४५६७८९. Once we've built support for a language, we always invite a group of native speakers to test and fill out a survey to understand their typing experience. To see if your language is already supported in our latest Gboard release in the Play Store, check out the list of supported languages in our help center. This entry was posted in Inside Search Blog and tagged Google Search, Seach, Search, Search Engine on December 18, 2018 by Search. We first met Emmett at Adaptive Design Association, an organization near Google’s NYC office that builds custom adaptations for children with disabilities. Communicating for him is difficult—he uses a clear plastic word board and looks at specific squares to try and get across what he wants to say. We thought we might be able to help. At the time, we were working on a special Morse Code layout for Gboard. With its simple dot and dash encoding, Morse is a good fit for assistive tech like switch access and sip-and-puff devices. Emmett was hoping to learn Morse as a more robust form of communication, and we wanted to make a small game to help him learn the new alphabet. Our first attempt was a small connect-the-dots spelling toy that drew Emmett's favorite cartoon character and only took a few days to build. 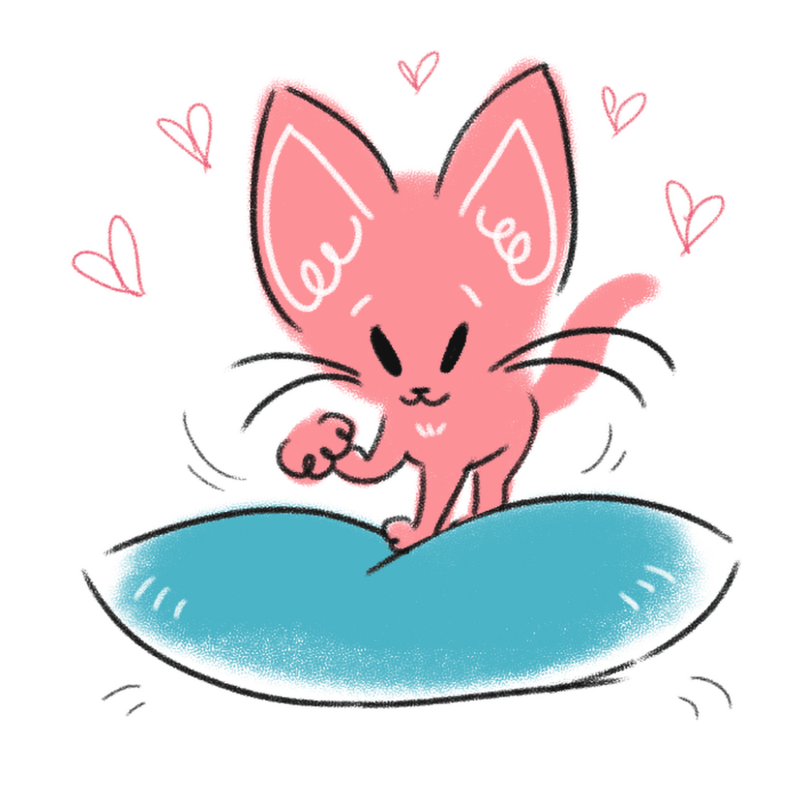 After watching Emmett get set up with his switches and start excitedly conquering pieces of the little Morse toy, we knew we wanted to do more. We partnered with Adaptive Design on a 48 hour hackathon, where independent designers and game developers worked with Emmett and another 4 kids to prototype games that made Morse code fun to learn. Here's more on how we partnered with Adaptive Design to create the prototype games. We’re posting the code for each independent team's games on the Experiments with Google website, where you can also find open-source examples that will help you get started with your own Morse-based apps. If you’re a developer, we hope these resources will inspire you to get involved with the community and make a difference by building your own accessibility projects. This entry was posted in Inside Search Blog and tagged accessibility, Google Search, Seach, Search, Search Engine on December 3, 2018 by Search. But there’s a cornucopia of searches you can do, and we took a look at some of the top and trending ideas that people are gobbling up to hone their side dish skills and perfect their pie game. Pardon me, but how do you plan to prep your turkey? There are many ways to toast a turkey, but here are the preferred cooking methods across the U.S. this year. While the Eastern Seaboard and some of the Southwest is fond of frying, smoked birds are booming in nearly half the country. 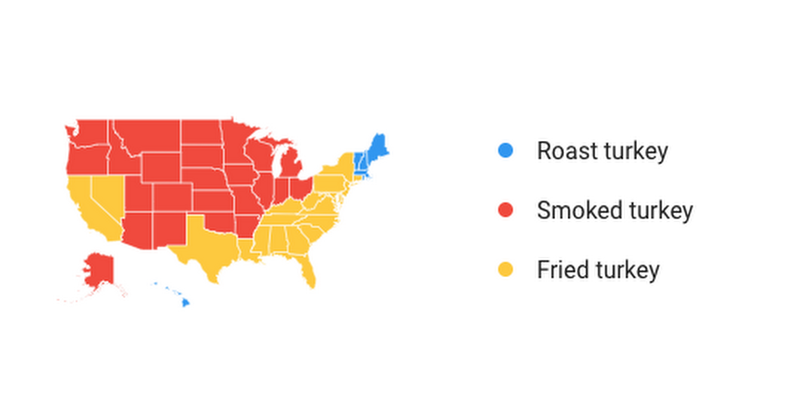 Hawaii joins New England in sticking to the classic roasted turkey. “Keto Thanksgiving” searches are hitting an all time high in 2018, with “keto Thanksgiving sides” up 70% YoY. 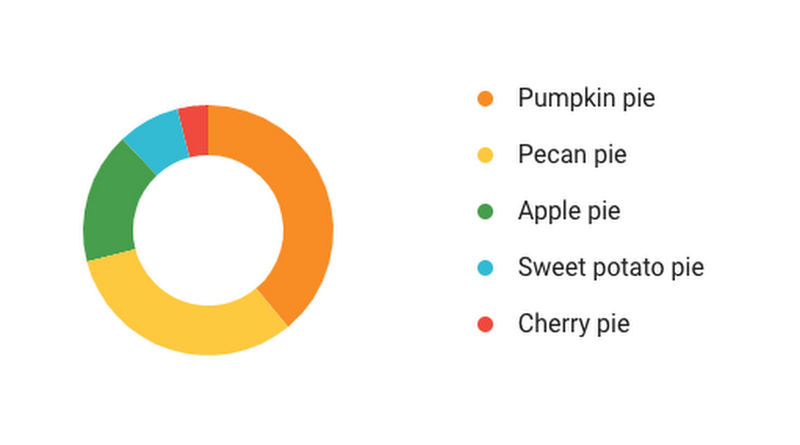 “Vegan Thanksgiving” has the highest interest among diet-specific searches, more than double the search interest of “keto Thanksgiving” and “vegetarian Thanksgiving” searches. “Gluten free Thanksgiving” is also on the rise, with searches for “gluten free thanksgiving sides” (+300% YoY), desserts (+100% YoY) and stuffing (+90% YoY) all trending up since last year. 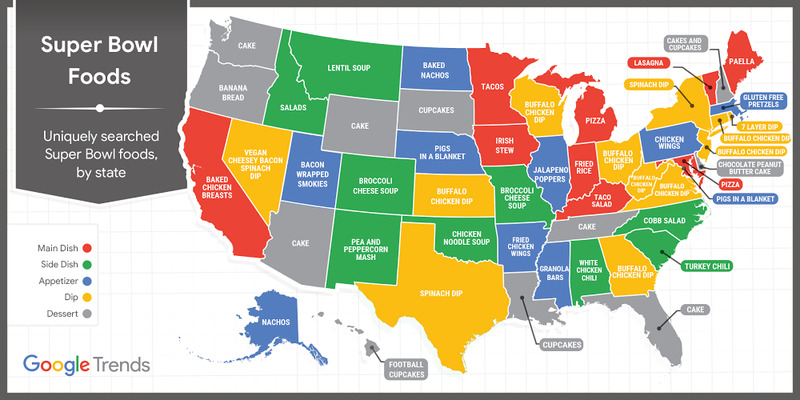 Many of these pie preferences can be regional, too. Here are the places where the top pies are poppin’ on Search. No matter how you celebrate and give thanks, you can find all the ideas you need on Search, get to your friends and family quickly and safely with help from Google Maps, and get to gobbling up that grub. This entry was posted in Inside Search Blog and tagged Google Search, Seach, Search, Search Engine on November 16, 2018 by Search. This entry was posted in Inside Search Blog and tagged Google Search, Seach, Search, Search Engine on November 12, 2018 by Search. The internet has enabled people worldwide to connect, create and distribute new works of art like never before. A key part of preserving this creative economy is ensuring creators and artists have a way to share and make money from their content—and preventing the flow of money to those who seek to pirate that content. Today, we're releasing our latest update on those efforts..
Our 2018 "How Google Fights Piracy" report explains the programs, policies, and technology we put in place to combat piracy online and ensure continued opportunities for creators around the world. $3 billion+:The amount YouTube has paid to rights holders who have monetized use of their content in other videos through Content ID, our industry-leading rights management tool. $100 million+: The amount we’ve invested in building Content ID, including staffing and computing resources. 3 billion+:The number of URLs that were removed from Search for infringing copyright since launching a submission tool for copyright owners and their agents. 10 million+:The number of ads that were disapproved by Google in 2017 that were suspected of copyright infringement or that linked to infringing sites. Create more and better legitimate alternatives: Piracy often arises when it's difficult for consumers to access legitimate content. By developing products that make it easy for users to access legitimate content, like Google Play Music and YouTube, Google helps drive revenue for creative industries and give consumers choice. Guard against abuse: Some actors will make false copyright infringement claims in order to have content they don't want online taken down. We’re committed to detecting and rejecting bogus infringement allegations, such as removals for political or competitive reasons. This entry was posted in Inside Search Blog and tagged Ads, Google Search, Public Policy, Seach, Search, Search Engine, YouTube on November 7, 2018 by Search.